Think of what limitations are put on us by the restrictions of our own eyesight: things too far away, or too small, are beyond our ability to observe without some sort of devices to help. Just as the telescope was a critical device for astronomers, the microscope was critical to the progress of biology. Although magnifying spectacles (glasses, sort of) have been in widespread use since the 1300s, the use of lenses to see very tiny objects was a slowly-developing technology. First of all, the tinier an object is, the less light reflects off it, and seeing anything really tiny requires a decent illumination system. Secondly, magnifying lenses used in early microscopes were not particularly even or clear, and tended to split light like a prism, which affected their resolution limits. Resolution can be thought of as the clarity of focus; technically, it is the limit at which two tiny objects which are close together stop being visibly separate. The resolution of early microscopes was very limited by the glass used in the lenses. Some important work was done with early microscopes, although they were primarily more of a toy than a scientific instrument. Like telescopes that were being developed through that same period, early microscopes used lenses in sequence (making them multi-lens or compound microscopes) to magnify an image. In 1660, Italian Marcello Malpighi was able to use a microscope to see blood capillaries in the tail of a live fish, providing powerful supporting evidence that blood circulates in the body (prior to this, since no one knew of how blood runs from arteries through capillaries to veins, it was thought that the blood flow was one-way from production in the intestines to consumption in the body tissues). In 1665, Englishman Robert Hooke found that cork was full of tiny chambers, which he called cells (there were no actual structures that we now call cells in the dead cork, but our modern term comes from his label). In the 1670s, Dutchman Antony van Leeuwenhoek, using a special, especially pure single lens (a simple microscope) placed in a holder and held up very close to the eye, was the first person to write extensively about a world of tiny independent creatures, which he called animalicules, which existed all around but were too small to see by eye. Imagine what an odd idea that must have been to the people of the day! It wasnt until the 1800s, through a interesting period including instances of thievery, plagiarism and questionable patent ethics, that many of the distortions of the lenses were corrected. With the technological limitations for microscopes mostly solved, by the end of the century microscopes had begun to hit resolution limits set by physics: to oversimplify, light beams themselves have a physical size, which when a gap is at or below about 0.2 micrometers can no longer fit through that gap - you cant see the gap, just a smudgy blob where the light has been blocked. Objects below that size just cannot be resolved as long as light is used in the imaging system. Light microscopes (because they use light as an imaging system) would remain useful, but most of the objects discussed in the next section on cell structures were invisible to them. Although there have been some recent techniques in improving light microscopes abilities, they are still limited. Through the middle of the 1900s, a new system was developed that could use a beam of electrons, which have an adjustable beam size but at their smallest are below atomic size. The beam is focused with magnets and the final image converted to light in a way similar to how television screens work. Recent versions of electron microscopes have been used to produce images of molecules and atoms. Electron microscopes are more expensive and complicated than light microscopes, and the beam needs to travel through a vacuum to avoid scattering off air atoms. It is extremely difficult to use them on living cells. They are very useful in research but not going to appear in teaching classroom labs any time soon. Most microscopes can be divided into another two groups, depending upon how the imaging beam interacts with the specimen. In scanning microscopes, the beam reflects off the surface of the specimen - this includes the electron microscopes that produce the impressive (and frequently creepy) "3-D" images, and from which the name comes (the electron beam scans across the surface) as well as the dissecting microscopes used in many labs. Transmission microscopes send the beam through the specimen. For a specimen to be useful in a transmission scope, the beam needs to be able to pass through it and reveal its internal details. Specimens may need to be stained, meaning colored or darkened with special dyes, to produce clear details. Colored dyes are used in light microscopy (the use of microscopes is called "microscopy"), while electron microscope stains have heavy metals in them (the images are black-and-white, sometimes photoshop-colorized for publication, so the stain just needs to produce variations in absorption). Obviously, large / thick specimens or structures are not going to let the beams through them; to see large specimens, the original object must be sectioned, converted into very thin slices, then stained for detail. Objects are embedded in a material that will hold them together (commonly wax for light microscopy, plastic for electron microscopy) while being thinly sliced. The ability to translate the two-dimensional information of sections into three-dimensional concepts is important in microscopy. It was soon determined that not only were large organisms made up of huge numbers of tiny cells (multicellular organisms), but tiny organisms existed that were made up of as few as a single cell (unicellular organisms, or single-celled organisms). And as microscopes and preparation methods improved, it was found that in the unicellular realm, there was a basic either-or difference in organisms: theirs might be a cell with a nucleus, like the cells found in multicellular organisms (eukaryotes) or a cell without a nucleus, assumed to be more simple and primitive (prokaryotes) and not found in multicelled forms. It also became evident that, on the unicellular level, the distinctions between animals and plants were less reliable. It is not unusual to find unicellular organisms that are mobile and food-gathering like animals but which are also green and photosynthetic. Were these animals or plants? As we have seen in the multi-Kingdom system, the definition difficulties were addressed by giving the unicellular forms their own Kingdoms, where they could continue to multi-task without upsetting humans and their labeling compulsions. - Everything alive is made up of at least one cell. - Cells can only be made from existing, related cells. - The smallest single thing that can be considered alive is a cell. - Cells of all living things are more alike than different. Everything alive is made up of at least one cell. The smallest organisms are single-celled, or unicellular. There is a range of complexity in cells covered later, but a size range in cells also exists, with smaller cells generally being "simpler." Larger organisms are made up of from several to trillions of cells, and are multicellular. In these organisms, the cells work together, with different cells doing different jobs to contribute to the function of the whole, each cell being dependent upon the contributions of the others. As often happens in biology, this is not totally a situation of either-or; between unicellular and multicellular are organisms that are unicellular and colonial, with cells that technically could live independent of each other, but which band together and split up functions similar to the way it is done in multicellular organisms. Cells can only be made from existing, related cells. For a very long time, people believed in spontaneous generation. It fit with what could be observed about the world and was so widely accepted that it was difficult to change. As discussed in the last chapter, some of the earliest developments of what would eventually be Scientific Method were worked out to address this question. Even after it became accepted that larger organisms do not spontaneously generate, it was accepted that microscopic organisms did. At the time of Schleiden and Schwann, and even well after, biologists thought that cells could be generated from such nonliving material as boiled chicken broth. The Cell Theory said that no, you can only get living cells from cells that are already there. It was an eventual addition that cells are only made by related cells - after germs were discovered, it was thought for some time that our body cells spontaneously generated the bacteria that carried diseases between people, eukaryotes producing prokaryotes. We now know that the bacteria use us as a source of nutrition and as their own little private ecosystems to make lots of offspring bacteria that we are nice enough to pass on to other people. The smallest single thing that can be considered alive is a cell. This is a rule that was more absolute back when Schleiden and Schwann first proposed it, since their microscopes limited what they could see below a certain size. It was almost another hundred years before viruses were discovered, and the bits and pieces inside cells that they could see seemed just that, contributory fragments that would be nothing by themselves. Today, viruses are controversial because they "break" so many rules, and some cell bits are much more cellular than anyone suspected they would be. Cells of all living things are more alike than different. This was not a part of the original theory, although the two researchers seemed to realize over time that what one discovered in plant cells the other was seeing in animal cells. It was still an era where terms were based more on how things differed than how they were the same, and for over a century any hypotheses that tried to apply rules across the whole of biology were controversial at least partly because of that. If single-cells can be entire organisms, why cant large organisms just be big cells? The answer to this question seems to lie in some geometry: as a cell gets larger (assuming a roughly spherical of cuboidal cell), it adds volume at a faster rate than it adds surface. The surface of a cell is a vital entry and exit point for needs and wastes - larger cells, in theory, wind up with more needs and wastes than their limited surfaces can deal with. There are ways around the problem: shape changes (flattening or lengthening, for instance - the cells in your skeletal muscles are the length of the muscles themselves, but are very thin) and cell projections can change the surface-volume ratio; cells may use internal exchange surfaces; and cells with little metabolic activity will probably be affected less. But the fact remains that cells tend to be small (ranging from one half to about 100 micrometers in diameter), and large organisms tend to be multicellular. There may be an additional explanation - multicellular organisms rarely are a mass of identical cells, but are almost always filled with cell types and collections of specialized cells called tissues. Multicellular organisms contain only a handful of tissue classes, but it is enough to produce huge diversity. You may find a lot of terminology in the sciences difficult to remember. Much of the origins of modern science goes back to a time where all of the various Europeans working in different disciplines agreed that Latin and some related Greek would be their common language for writing and naming things. This tradition continued into the 19th Century, when the idea of publishing in a dead language lagged (the primary languages of Science, or at least Biology, became German, English and eventually Russian); the tradition of basing names on Latin faded more gradually, but by the middle of the 20th Century most new terms were being made by scientists in their native languages or something close to it. 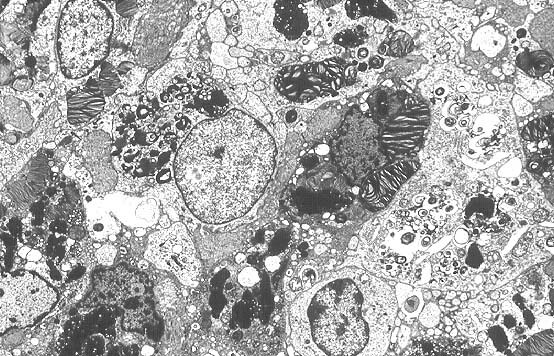 Electron microscopy and other sciences, most notably ecology, were advanced mostly in the U.K. and the U.S. and are therefore full of English or Latin-English hybrid terms that you may find easier to remember, and the more advanced / newer (in microscopy, the smaller structures) terms have a larger-and-larger English component. This means that in many ways learning the basics may be much tougher than learning the advanced concepts. Maybe. A Page of links demonstrating visually some aspects of microscopy. An easy-to-read history of the microscope. Terms are in the order they appear. Copyright 2003 - 2012, Michael McDarby. Reproduction and/or dissemination without permission is prohibited. Linking to these pages is fine.